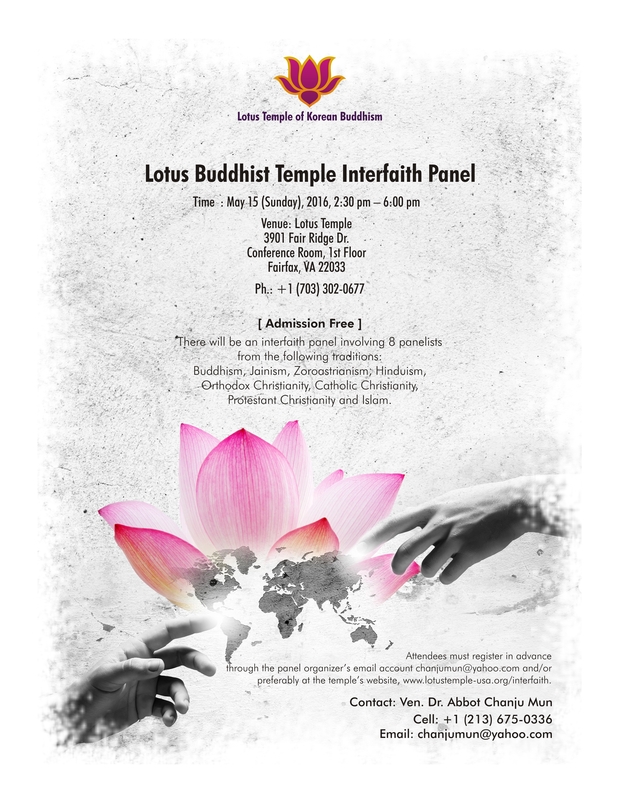 There will be an interfaith panel involving 8 panelists from the following traditions: Buddhism, Jainism, Hinduism, Zoroastrianism, Orthodox Christianity, Catholic Christianity, Protestant Christianity and Islam. I am honored to write these congratulatory messages for this interfaith panel involving eight world religions organized by my monastic disciple Venerable Dr. Seongwon Seunim (Chanju Mun) and his close friend Dr. B. N. Hebbar of George Washington University. Seongwon Seunim has conducted research in Buddhism in various religious and education institutions in Korea and abroad and is currently teaching Buddhism and World Religions at the prestigious Coastal Carolina University. Seongwon Seunim also edited and published seven volumes on religions and peace. I really appreciate the aforementioned two organizers host the panel. I sincerely hope that the panel may help Buddhists and other religious believers to remove conflict and violence and improve peace and harmony, even a little bit. Seongwon Seunim established Blue Pine Books in the United States in 2005 and is making efforts to academically and religiously contribute to the dissemination and promotion of peace in world. He collected almost two hundred articles from renowned scholars across the world, edited and published them in seven serial volumes on Buddhism and peace. By so doing, he was able to establish a human and scholarly network for contributing to world peace through academics. He recently decided to extend the theme of the series from Buddhism and peace to religions and peace and planned, edited and published the first series on the extended theme. I think that he also organized this interfaith panel to make dialogues and cooperation among religions. While some Korean Buddhists hierarchically classified Huayan, vinaya, Yogācāra, Mādhyamaka, Tiantai, Chan, Pure Land and Tantric Buddhist traditions from their own sectarian perspectives, the majority of Korean Buddhists ecumenically viewed various Buddhist traditions. As a result, Korean Buddhism successfully developed harmony and unity among Korean Buddhist sects and traditions throughout history. In this context, because Jogye Order of Korean Buddhism keeps ecumenism between Chan, doctrinal and vinaya traditions, between self-cultivation and other-benefitting, between Pure Land and Seon Buddhism, and between doctrinal and Seon Buddhism, it does not make conflicts with and perpetrate violence against other minor Korean Buddhist sects. Korean Buddhists also generally advocated ecumenism between the three traditional East Asian religions of Confucianism, Buddhism and Daoism and contributed to harmony and peace among religions in pre-modern times. Korean Buddhism should have close relations with other Buddhist traditions. Therefore, I have for a couple of decades continuously made religious connections and promoted religious exchanges with Indo-Tibetan, Chinese-Taiwanese, Japanese and Western Buddhism through my established Guryong-sa Temple, Yeorae-sa (Buddha) Temple and other Buddhist institutions. I received strong spiritual influence from H. H. the 14th Dalai Lama Tenzin Gyatso of Tibetan Buddhism and Grand Master Hsing Yun, the founder of the huge Fo Guang Shan Monastery in Taiwan, of Chinese Buddhism. I have had close friendship with the late Kamata Kōmyō, former abbot of Kyōgan-ji Temple, his son Kamata Tetsuo, current abbot of the temple, and Takehara Chimyō, abbot of Shōgyō-ji Temple of Japanese Shin Buddhism. Buddhism should have close and mutual relations with Hinduism, Islam, Christianity, Confucianism, Daoism, shamanism, Bonism, Shintōism and other religious traditions. Because Buddhism did not philosophically and doctrinally accept dualism and dichotomy, it did not make conflicts and wars with other religions. It reduced conflicts and violence and increased harmony and unity in society and among religions. It did not make and justify violence and conflicts in its name throughout history and all over the world. I think that any religion should contribute to the unity and harmony in society and in the world and should not make any conflict and violence in society and in the world. In this context, I strongly believe that this interfaith panel may academically and religiously support the construction of unity and harmony in society and in the world. We Buddhists in particular and we religious believers in general should make peace and harmony domestically and internationally not as an optional religious objective but as a mandatory religious objective. I think that when Buddhists and religious believers build peace and harmony among various Buddhist traditions and among various religious traditions respectively, we are able to naturally and inevitably accomplish peace and harmony among Buddhist traditions and among religious traditions respectively. We Buddhists and we religious believers should gradually, not suddenly, make efforts and disseminate the concepts of peace and harmony in various contexts, for example, in the individual, social, natural, world and cultural contexts. Finally, Seongwon Seunim and his close friend Dr. Hebbar will make this invaluable interfaith panel firmly locate Buddhism in particular and world religions in general in the international religious context. Seongwon Seunim along with his co-organizer Dr. Hebbar planned and organized this panel and academically and religiously attempted to make peace in international contexts. I sincerely hope that attendees come to understand the meaning of peace in different religious contexts through the presentations of these eminent panelists. I admire how well Seongwon Seunim and Dr. Hebbar organized the interfaith panel and strongly wish that they might realize their goal of peace in the world. I shall briefly explain the historical and academic background of this current seventh serial volume on Buddhism and peace. Venerable Daewon Seunim initiated the International Seminars on Buddhism and Leadership for Peace, biannually held seven times from 1983 to 1995. He came to Honolulu, Hawaii in 1975 and established Dae Won Sa Buddhist Temple at that time. He eventually made it the largest Korean Buddhist temple in North America. He was one of pioneers in introducing Korean Buddhism to the United States. I wrote about him and his peace activities in detail in a paper entitled “Venerable Daewon Ki and Peacemaking” in my edited Mediators and Meditators: Buddhism and Peacemaking (Honolulu: Blue Pine, 2007), pp. v-xxv. Venerable Daewon Seunim concentrated his peace activities in two areas. First, he focused on making peace in the world by inviting a number of eminent scholars to and holding seven international seminars and disseminating Buddhist teachings on peace and justice. Second, as a Korean Buddhist monk, he dedicated his peace activities to bringing peace between North and South Korea. He visited North Korea eight times between July 1988 and December 1996. Between these visits, he hosted numerous meetings with many of the high-ranking administrators and politicians of the North Korean government and had thirteen official meetings with the Federation of North Korean Buddhists. In 2005, he assigned to me the task of revitalizing the discussions on Buddhism and peace. Accordingly, I edited and published five serial volumes on Buddhism and peace since then. My close colleague, Ronald S. Green, and I extended the theme of the series from Buddhism and peace to world religions and peace in the sixth volume in the series. We included eleven articles by experts in various religions and recently edited and published the volume entitled Living in Peace: Insights from World Religions (Honolulu: Blue Pine, 2012). I selected papers from the fifth seminar, held in Seoul, South Korea during November 18-21, 1991 on the theme of “Exploration of Ways to Put Buddhist Thought into Social Practice for Peace and Justice” and published them in my coedited Buddhist Exploration of Peace and Justice (Honolulu: Blue Pine, 2006). The seminar was held under the joint sponsorship of Dae Won Sa Buddhist Temple and the Korean Buddhist Research Institute of Dongguk University. More than 60 seminar participants came from Canada, China, Germany, India, Japan, Korea, Mongolia, Sri Lanka, Sweden, Thailand, Vietnam, and the United States. I selected articles from the seventh seminar, held in Honolulu during June 3-8, 1995 on the theme of “Buddhism and Peace: Theory and Practice” and edited and published them in my edited Buddhism and Peace: Theory and Practice (Honolulu: Blue Pine, 2006). The seminar was held under the joint auspices of the Dae Won Sa Buddhist Temple and the Department of Philosophy at the University of Hawaii – Manoa. More than 40 scholars and religious leaders from Asia, Europe and the United States participated in the seminar. I chose articles from the first and second seminars held in Honolulu during October 22-28, 1983 and in Tokyo Japan during December 2-7, 1985 and published them in my edited The World is One Flower: Buddhist Leadership for Peace (Honolulu: Blue Pine, 2006). The first seminar proceeded under the auspices of the Dae Won Sa Buddhist Temple and the Department of Political Science, University of Hawaii – Manoa on the theme of “Buddhism and Leadership for Peace.” The theme of “Buddhism in the Context of Various Countries” was examined in the second seminar under the joint sponsorship of the Dae Won Sa Buddhist Temple and the Peace Research Institute of Sōka University. Participants came from China, South Korea, Sri Lanka, Soviet Union, Thailand, and the United States in the first seminar. Individuals from these six nations as well as from Bali, India and Mongolia participated in the second seminar. I selected papers from the third seminar, held in Honolulu during May 23-28, 1987 on the theme of “Peacemaking in Buddhist Contexts” and edited, included and published them in my edited Mediators and Meditators: Buddhism and Peacemaking (Honolulu: Blue Pine, 2007). The seminar was cosponsored by the Dae Won Sa Buddhist Temple and the Peace Institute of the University of Hawaii – Manoa. Participants included those from China, Japan, South Korea, Mongolia, the Soviet Union, Thailand, and the United States. I also selected excellent papers among the numerous submitted to the editorial board of Blue Pine Books between 2006 and 2007, editing and publishing them. I was fortunate to have received so many excellent papers between 2007 and 2008 and along with coeditor, Ronald S. Green chose among them to fit the fifth serial book on Buddhism and peace by Blue Pine Books. Because of their lasting importance, I also included in the volume entitled Buddhist Roles in Peacemaking: How Buddhism Can Contribute to Sustainable Peace (Honolulu: Blue Pine, 2009) two articles presented at the sixth seminar held in Honolulu during November 24-28, 1993 on the theme of “A Buddhist Worldview and Concept of Peace,” those by Y. Karunadasa and David Putney. We issued a call for paper online and off for the sixth serial volume on world religions and peace. Although we received numerous outstanding submissions, an overwhelming number of them focused on Buddhism and peace. This being the case, we decided to reserve many of these for the current seventh serial volume. We also issued a call for papers on Buddhism and peace for the seventh serial volume. We included fourteen articles on them in this current seventh volume, consisting of some high-quality articles submitted for the sixth serial volume and some additional high-quality articles selected among a number of articles submitted for the seventh volume. Because I discussed Venerable Jungwoo Seunim in an article entitled “Lee Jungwoo and Peacemaking: Theory and Practice” included in the sixth serial volume, I discussed him in a broader context in another article entitled “Lee Jungwoo (b. 1952), modern Tongdo-sa Temple’s vinaya (discipline) masters, and their peacemaking ecumenism” included in this current seventh volume. Tongdo-sa Temple has been the foundation of Korean Buddhism’s vinaya tradition throughout Korean history. I discussed in the article how Lee Jungwoo loyally inherited modern Tongdo-sa Temple’s vinaya masters and practically incorporated their ecumenism in his peacemaking. Even though they were vinaya masters, they did not sectarianistically advocate only vinaya tradition of Korean Buddhism but ecumenically considered and practiced various traditions. Lee Jungwoo applied Korean Buddhism’s ecumenical tradition to promote unity and peace among Buddhist traditions in particular and among religious groups in general. He did not exclude any Buddhist doctrine and practice in his Buddhist philosophy and practice and did not place any specific Buddhist philosophy or practice over others. He harmonized various Buddhist practices such as the meditation of Seon (known in Chinese as Chan and in Japanese as Zen), the chanting of Tantric mantras, the recitations of the names of Buddhas and bodhisattvas, the recollection of Buddhist images, and other forms of practice. Nor did he treat doctrines and practices as opposing each other, but as being mutually complementary. We included in this seventh volume the article entitled “Buddhism and Peace: The Creation of a Saṅgha in London.” It was submitted by the Archives Committee of Shōgyō-ji Temple in Fukuoka, informally affiliated with the Higashi Hongan-ji Sect of Pure Land Shin Buddhism in Japan. That temple has a sister relationship with Guryong-sa Temple in Seoul, which Venerable Jungwoo Seunim established. Guryong-sa Temple is affiliated with the Jogye Order of Korean Buddhism, the largest denomination of Korean Buddhism. Satō Kemmyō, a resident priest of Shōgyō-ji Temple, also kindly allowed us to reuse his published article entitled “D. T. Suzuki and the Question of War” in this volume. Finally, I extend my deep appreciations to Venerable Jungwoo Seunim who directed me to ecumenical philosophy and practice. Without his spiritual guidance and financial support, I would have been unable to edit and publish the seven serial volumes on religions (Buddhism) and peace. I am also indebted to almost one hundred fifty authors who allowed me to publish their valuable articles in the series. I cannot omit my sincere thanks to Ven. Puhui, abbess of Shenzhai-tang Temple in Taiwan, Ven. Huizhi, abbess of Fayun Lanruo Temple in Taiwan, Dr. Green, coeditor of my established Blue Pine Books, and Ven. Hongning, its secretary.